In the heart of Arizonaâ€™s Sonoran Desert sits Tucson, known for 350 days of sunshine each year. A few weeks ago we came through, and it was indeed quite sunny and warm. We had the pleasure of visiting Toni and Jade, the dynamic mother/daughter duo behind El Pais, an in-development mid-century motel and vintage trailer campground. 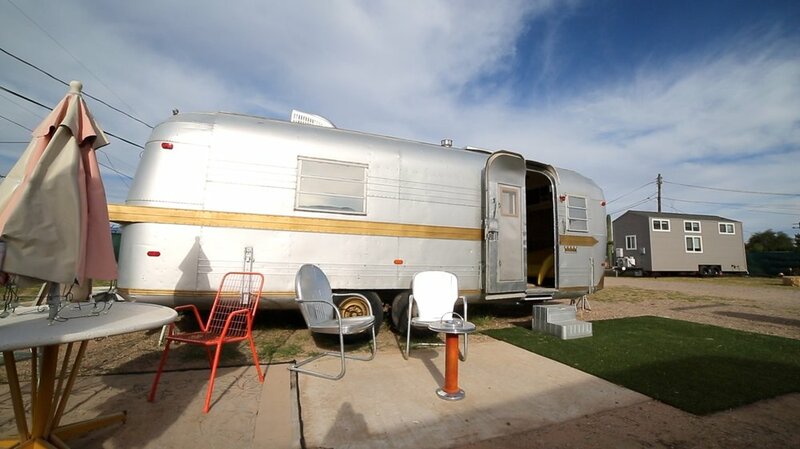 They have long have had a love for vintage trailer restoration. In fact, that is how Toni put her children through college. Together Toni and Jade are bringing their creative energy and DIY entrepreneurial spirit to this darling, fun business. While it is scheduled to open in January 2019, you can now book a stay in a lovely tiny house on wheels. They partnered with Hummingbird Tiny Home Inn to offer tiny house rentals, while the Inn works to secure land in northern Arizona. The Inn creators, the Beers Family, collaborated with Uncharted Tiny Homes to create a fleet of five tiny houses of varying sizes and designsâ€”coming soon to El Pais. The Beers are also currently designing a custom tiny home for their growing family. We love how El Pais guests can experience tiny houses on wheels of the past and present-day, in one groovy place. Lucky guests may also catch one of their vivacious, kitschy events. They have already hosted a couple fabulous parties, and in the future, their events will include live music, farmersâ€™ markets and retro rallies. Follow them on Instagram to learn of future happenings and see the unveiling of newly restored vintage trailers! Join us Tuesdays to see our future tiny house parking spots!